The 18th January is Winnie the Pooh day in honour of A.A. Milne’s birth date, and so we decided to celebrate and have Winnie the Pooh week. 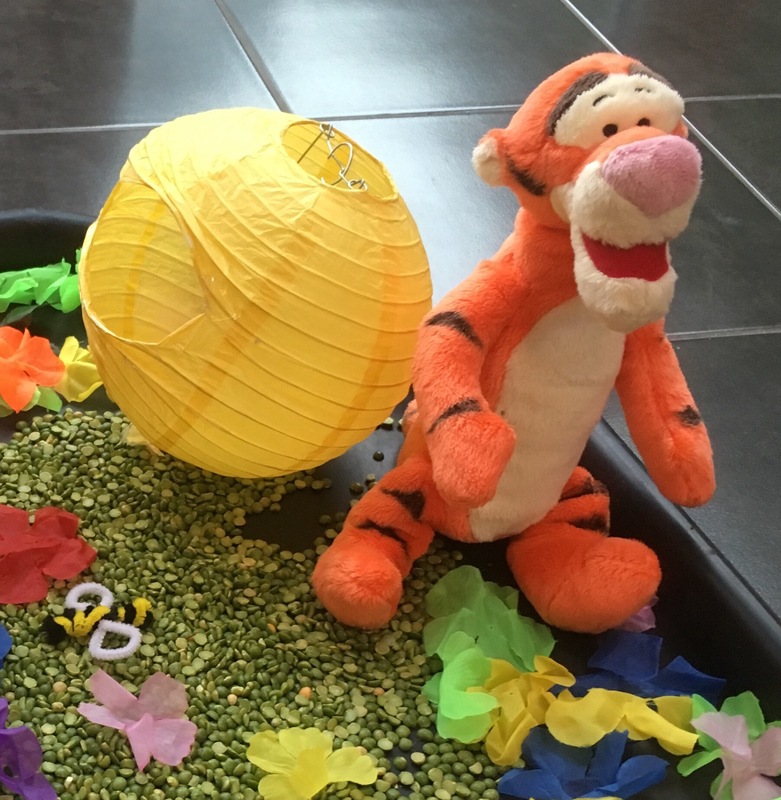 I love Winnie the Pooh but I wasn’t sure how it would work, as a lot of the activities and ideas I had seen were for older children. 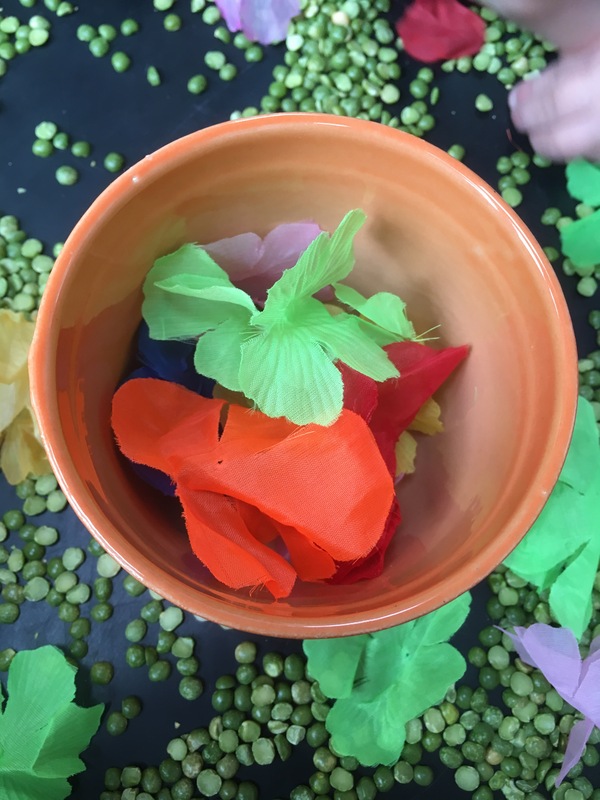 However, it turned out to be one of the most successful themes we’ve done – Bobcat loved the sensory play and kept asking to go back again and again! 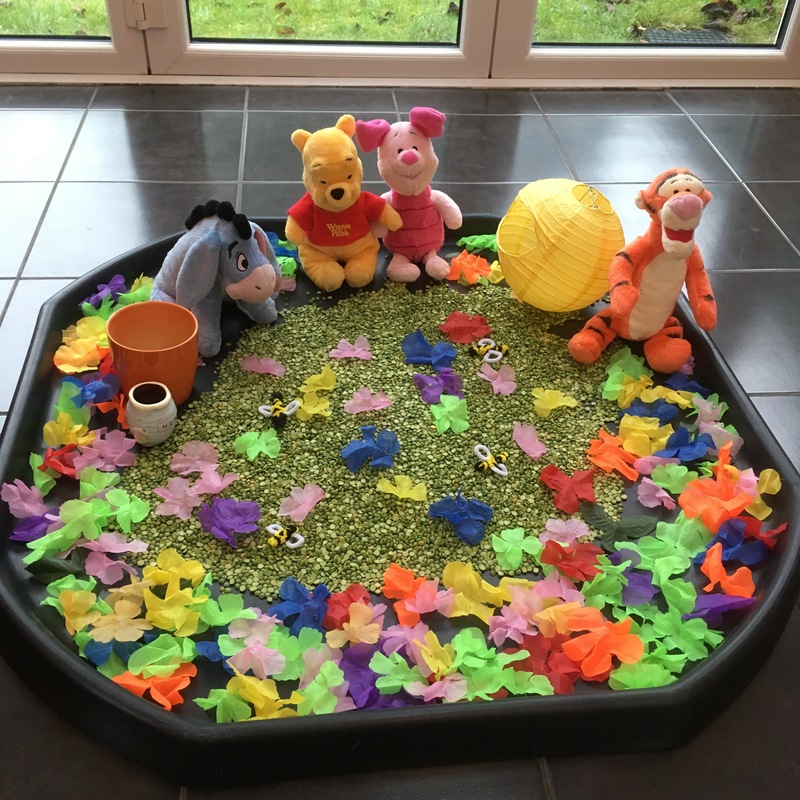 For our sensory tray we had Winnie the Pooh’s garden. 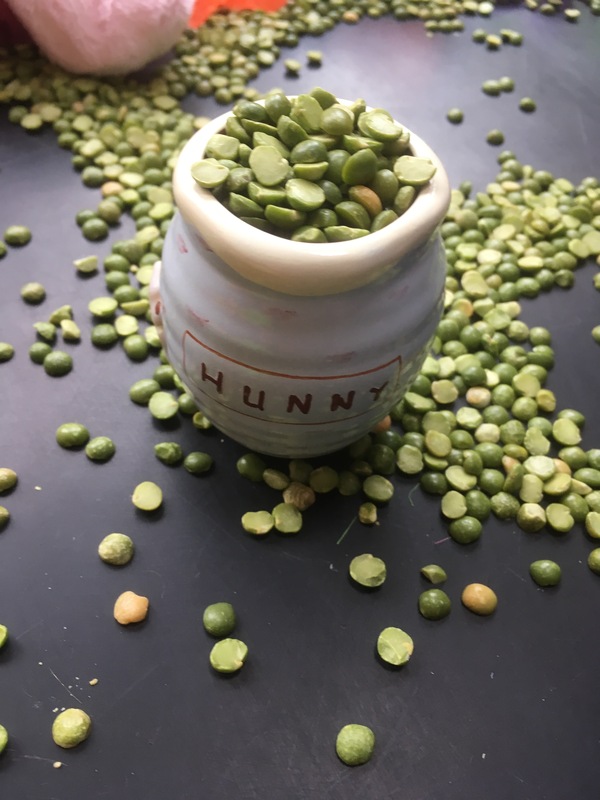 The base is split peas. Bobcat seemed to love the fact that they were dry and didn’t stick to him, and definitely enjoyed picking them up and pouring them. Little monkey loved lying in them and sliding through them on her front. 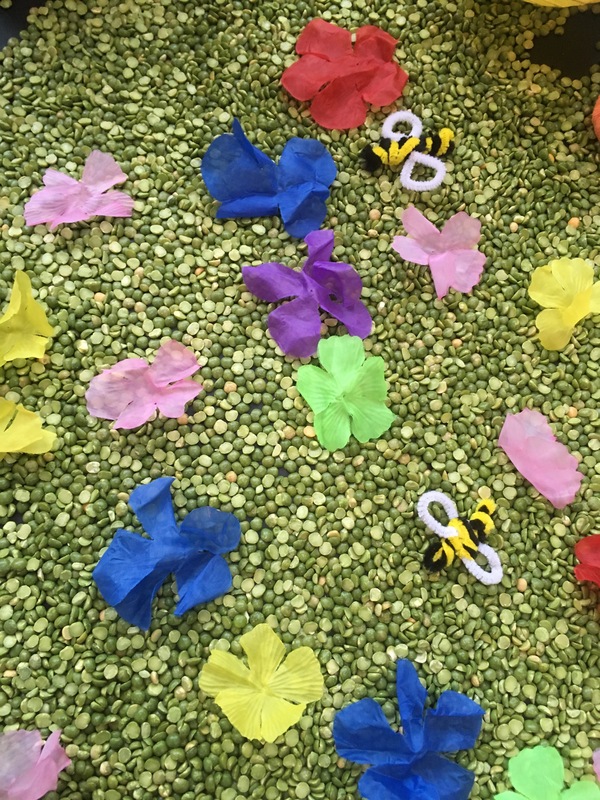 The flowers were some cut up Hawaiian garlands. 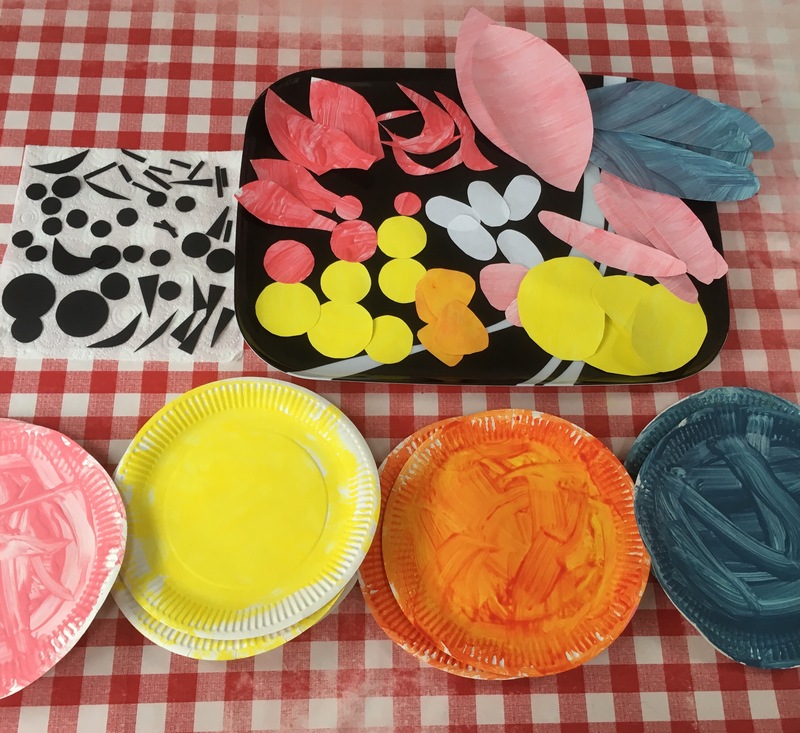 We did lots of finding and matching colours with these. And I made some bees out of black, yellow and white pipe cleaners. I also added our cuddly characters, a couple of pots (one was a flower pot and the other a Winnie the Pooh pencil pot I already had) and the hive. The hive was left over from an event I did last year – it’s basically a paper light shade with a hole cut in the side. 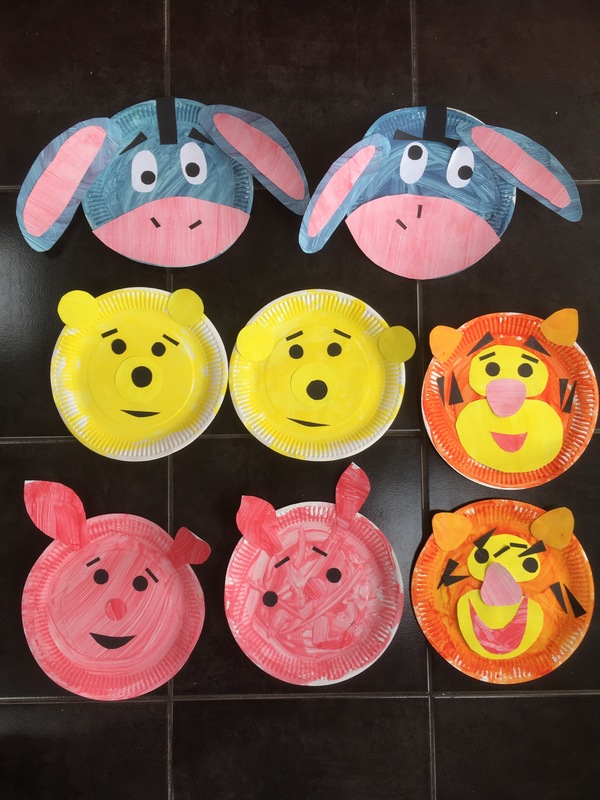 Our Winnie the Pooh craft activity was to make paper plates of some of the characters. 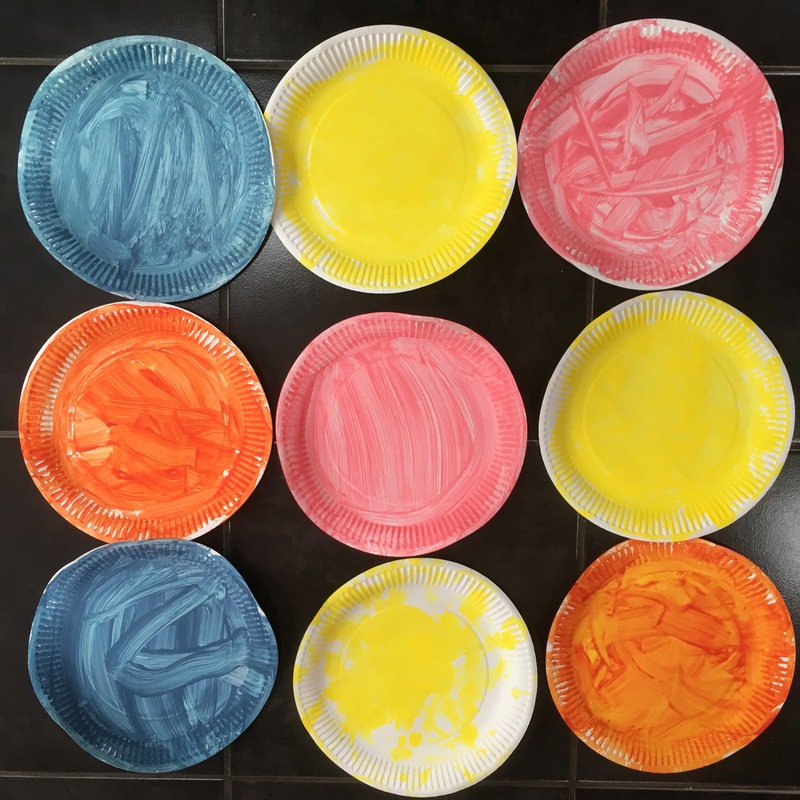 First we painted the plates the different colours. We also painted some white card in matching colours for the ears and other features. And Little Monkey decided she would rather be Winnie the Pooh herself and mainly just painted her own face! We left them to dry for a couple of days before coming back to them later in the week to finish them off. From past experience I have learnt that it is best to have all the pieces of the craft ready before the kids get to it, especially with Bobcats current obsession with scissors! So I looked at pictures of the characters and tried to work out what different shapes and colours we might need. I put these all out on a tray ready for Bobcat. Then we looked at each soft toy character one at a time, talked about the different shapes and colours on their face, picked the ones we wanted, and arranged the pieces on our plates. I really enjoyed sitting and doing this together with Bobcat and we discovered some interesting things. He was quite obsessed with the eyebrows and I realised this is a key feature that really distinguishes the Winnie the Pooh characters. They are the difference between a generic pig and piglet, a generic bear and Pooh bear! And then we decided to try making some honey based cereal bars. 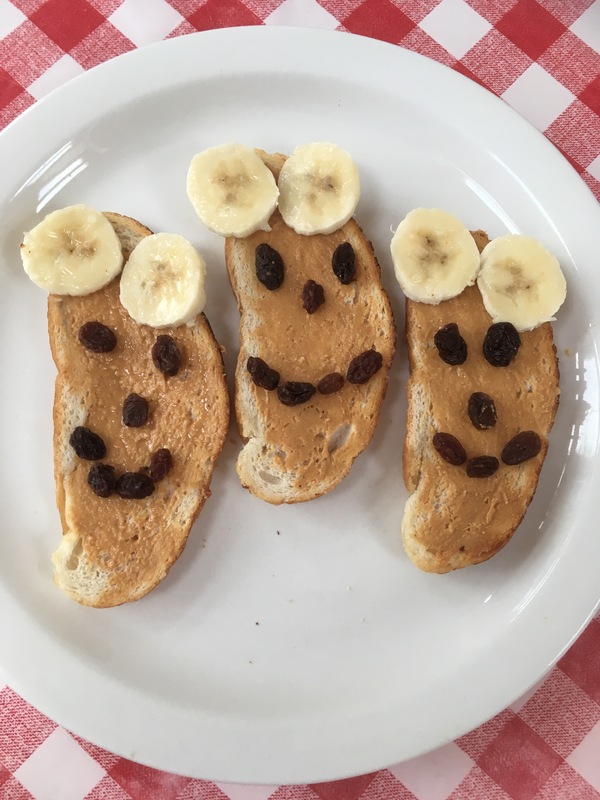 First we used the recipe from Kelly’s Classroom to make peanut butter based snacks. 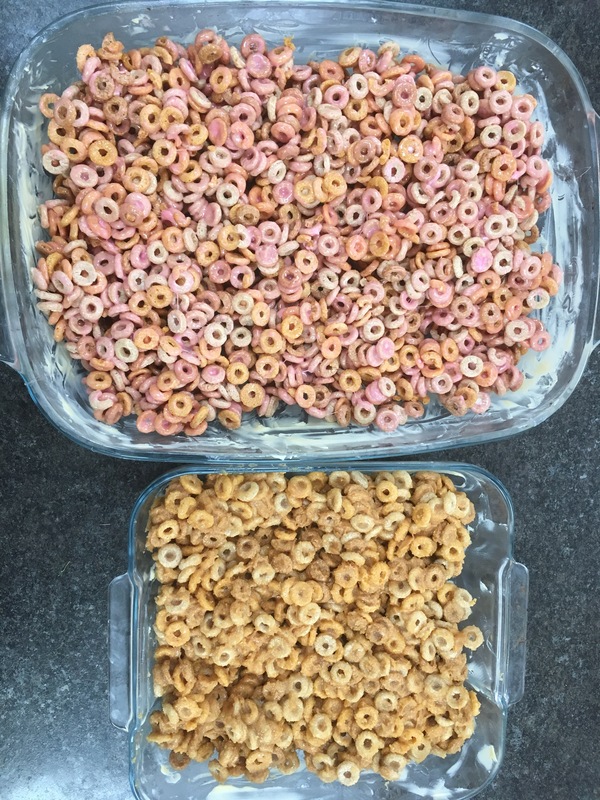 Then we melted marshmallows and butter in the microwave and added cheerios and honey to make marshmallow based treats. These were ridiculously sweet – I think we used too many marshmallows! They were good fun to mix and create though! And of course we watched Winnie the Pooh! We have the 1977 classic ‘The Many Adventures Of Winnie The Pooh’ as it’s the one I loved to watch when I was little, and I always think of the blustery day scene whenever it’s windy outside! We joined in with Pooh bears exercises as we watched! We had great fun celebrating Winnie the Pooh day. What other themes do you think we should do? 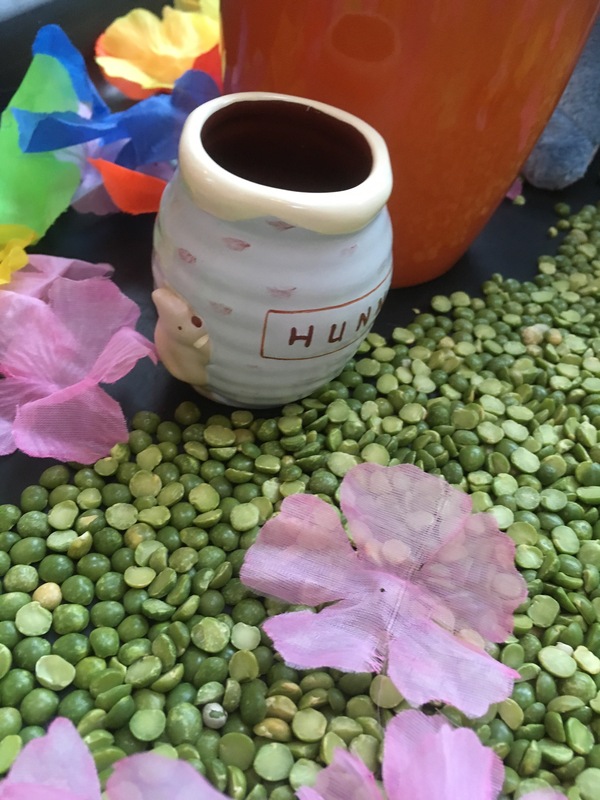 Which special days do you like to celebrate?